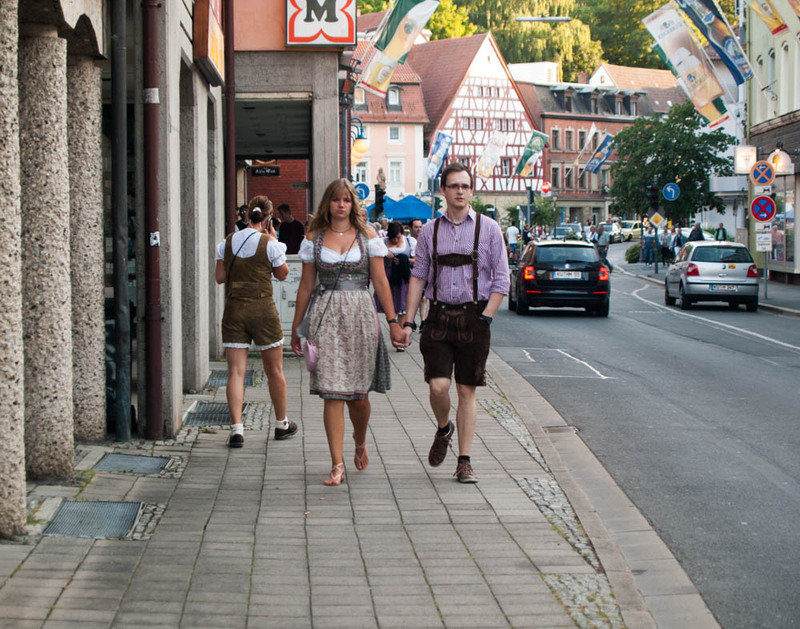 Rock those pink Lederhosen. 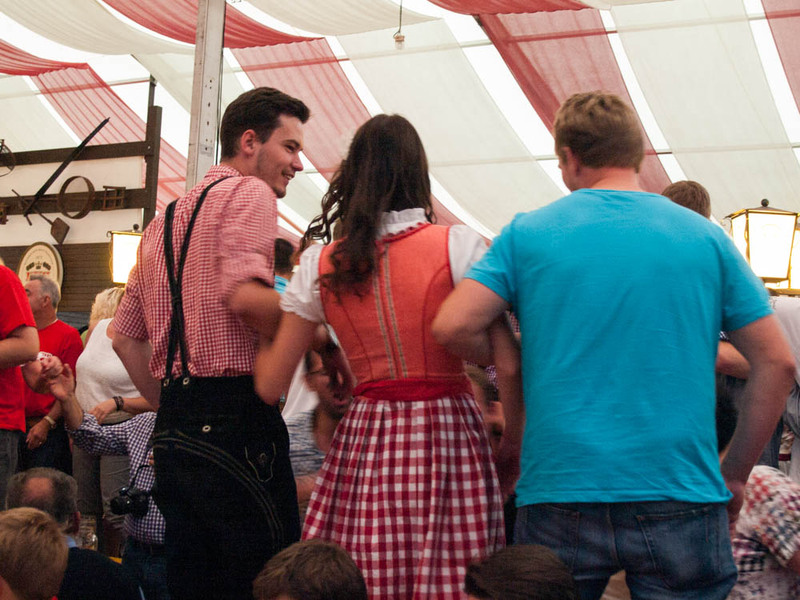 Tracht–traditional dress, which in Bavaria consists of Lederhosen and Dirndl–is still very much in style. August 3, 2015 I spent the weekend on my favorite organic farm in Kulmbach, a tiny Dorf in the heart of the Bavarian countryside. We weeded and harvested and chopped and canned and pickled, and then on Friday evening went down to the local Beer Festival. As I have written before, the part of Germany I am living in is the land of wine–to the South and West, along the banks of the Rhine River. The cities are full of Weinstuben, and in the summer there is some Weinfest or another on almost every corner, with lights strung up in the vineyards and rows of champagne flutes and wine glasses, fancy French pizza and slices of Zwiebelkuchen. Here in Bavaria, however, the Weinkultur is replaced by Bierkultur: a little more insanity, a little less inhibition, and a lot more of what looks to my mostly-vegetarian eyes like enormous portions of raw meat. No champagne flutes here–you drink from a Maßkrug, a glass mug that holds an entire liter of beer. And you dance, not on the ground in front of the stage like normal people, but on the tables. A tent full of some 2,000 euphoric, Maß-drinking Germans dancing on picnic tables to Schlager is a sight to see. 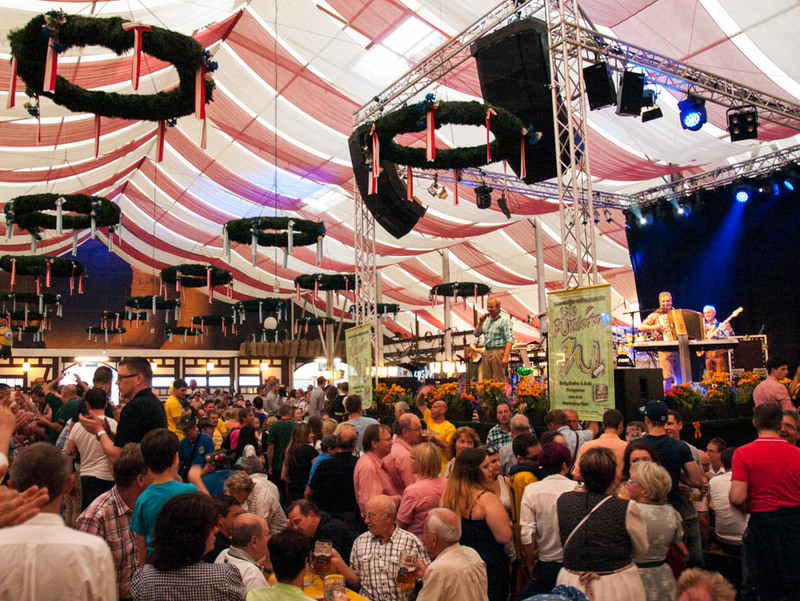 Inside the Bierzelt (Beer Tent). 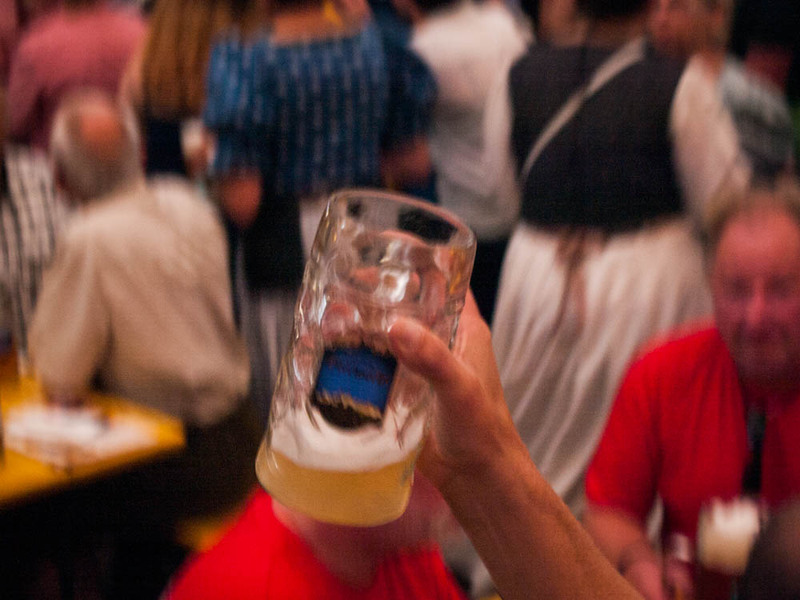 The band interrupted itself every five minutes so that the entire hall could sing the ultimate German drinking song–Ein Prosit, ein Prosit der Gemütlichkeit!–mugs in the air, cheers all around. 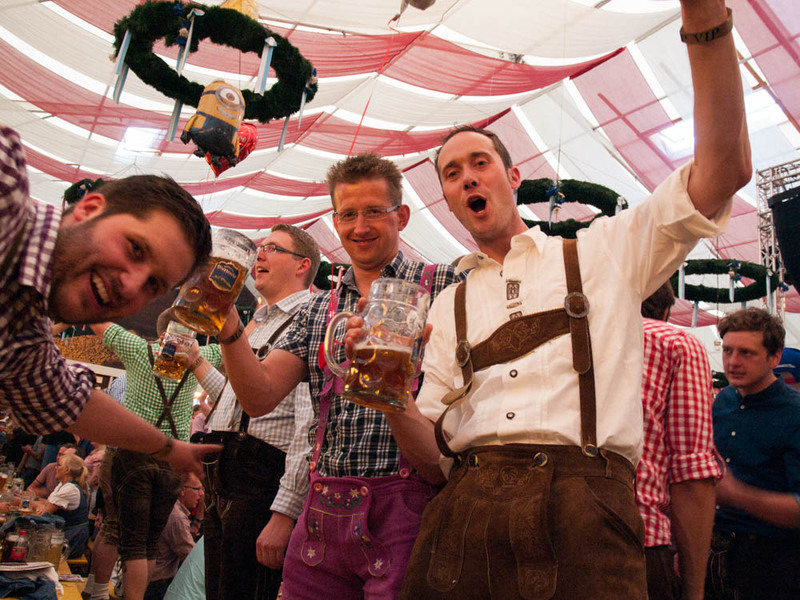 Germans are not particularly well-known for their party dancing skills, but they have Schunkeln down pat–link hands with the friends or strangers next to you, sway back and forth until somebody falls off the bench or the next Prosit comes around. After the sun went down, I went back to the festival without my camera, and danced on the tables with strangers and sang along to all the Schlager, and also to Sweet Caroline for good measure. Good times never seemed so good, and all that. The pure joie de vivre in the air was absolutely redemptive. This entry was tagged alcohol, Bavaria, Bayern, beer, beerfest, Bierfest, Deutschland, Dirndl, food, German culture, Germany, Kulmbach, Lederhosen, party, photography, Schlager, Tracht, travel. Bookmark the permalink. Sweet Caroline……Boston Red Sox 7th inning stretch theme song!!! But at Fenway, the beer is served in comparatively puny plastic cups…..